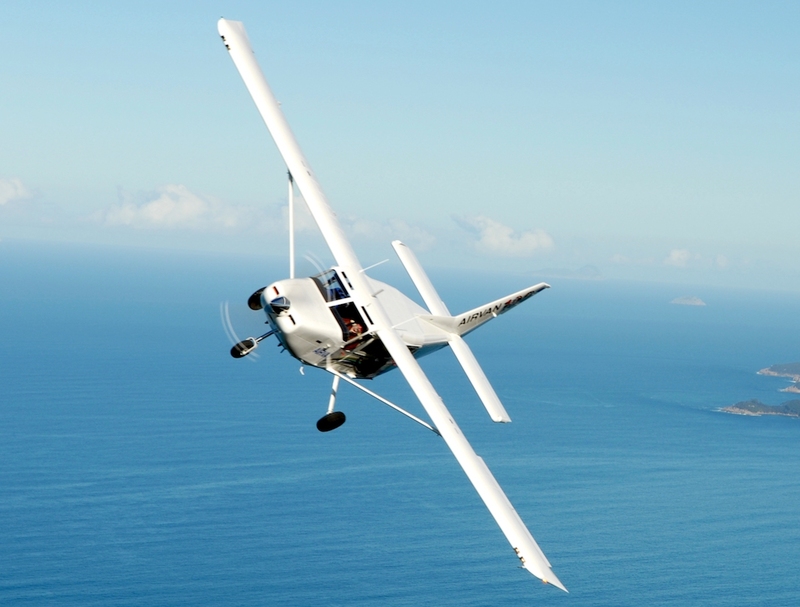 This story from the Australian Aviation archives comes from March 2012, when Owen Zupp took the Gipps Aero GA8-TC on a test flight. The Australian character has long been associated with getting the job done and a practical approach to solving problems. No fuss. No worries. If it were possible to take that philosophy and capture it an airframe, then the team at GippsAero may well have done this in the form of the GA8 Airvan. GippsAero is tucked away in Victoria’s Latrobe Valley, seemingly going about its business with a minimum of fuss. Yet from this regional airport has grown a substantial production line of aircraft which has positioned the GA8 Airvan to become the most prolific Australian designed, type-certificated aircraft. As far back as 1993, the then Gippsland Aeronautics saw an opportunity to develop an aircraft between the six-seat piston workhorse Cessna 206 and the larger, more expensive turboprops. 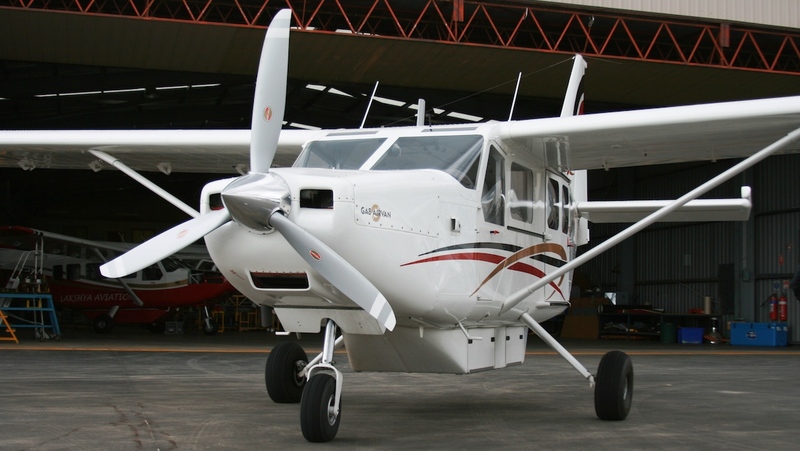 The Cessna 207 offered a little more size than the Cessna 206 and was generally regarded as a dollar-maker by operators, but a slug-wagon by those who had to fly them. This stemmed from the fact that the 207 was a ‘stretch’ of a tremendous aeroplane rather than a new look. As a totally new design, the Airvan had to comply with the rigid requirements of the Federal Aviation Regulations, FAR Part 23. FAR 23 calls for compliance on all manner of design aspects to ensure airworthiness in areas such as structural loads, airframe and performance through to stability, controllability, seat construction, fire prevention, escape hatches – the list goes on. Many aircraft flying today, even new aircraft whose heritage pre-dates the requirements, do not conform to FAR 23. Following this rigorous design process, the prototype Airvan was flown in 1996 and the first deliveries were made in 2000, with numbers a decade later verging on 180 and spread to all corners of the globe. It’s blowing quite a breeze outside as I approach the GA8 Airvan inside one of GippsAero’s hangars with chief pilot Dave Wheatland. I pause for a moment at a distance and weigh up the aeroplane from a holistic viewpoint before I get too close and immersed in the details. Immediately, a sense of function strikes me – this aeroplane has been designed to get the job done. At first glance, the large fuselage is very angular to maximise the volumetric capacity inside and is ideal for freight. To accommodate the roughest of airstrips, the aircraft sits quite high off the ground with generous propeller clearance, and on a sturdy looking undercarriage without an exposed nose oleo to get covered in grit and damage the seals. While the two crew seats have their own door, cabin access is via a huge sliding side door which would be ideal for all manner of freight, passengers boarding and parachutists exiting. The horizontal tailplane sits at a good height to allow a loaded utility vehicle access to the door without fear of driving into the empennage. I assess item after item for form and function and I like what I see. I flew piston singles in the Kimberleys some years ago and the Airvan seems to have ticked off all manner of features from the bush pilot’s wishlist. As Dave begins to explain the aircraft in detail, I begin to appreciate that this practical philosophy has been applied to even the smallest detail. The pilot’s door is locked back flush against the nose cowling by the same mechanism that opens and closes the door – a large red unambiguous lever on the door’s arm rest. Simple to operate, it would be ideal for everyday operations or in a dire emergency. At the pilot’s feet there is a covered panel of circuit breakers associated with the battery, which lies beneath the floor. In turn, the external power receptacle is just outside the door for engine starts should the battery fail. Everything is at hand with a minimum of wiring. The electrical system is a dual “bus” system linked to the alternator and battery. Like an aircraft of far greater size, this electrical system can load shed down to the bare essentials in the case of a systems failure with the critical items all stemming from the battery bus – a great insurance policy. Outside the cockpit, there is no need to duck under the Airvan’s high wing. Its 12.4m span holds over 330 litres of useable fuel that feeds from two wing tanks into a sump tank beneath the floor before feeding through a boost pump, a shut-off valve and on to the engine. Inside the cockpit, fuel management is very simple as there is no need to select individual tanks. The fuel panel consists of a shut-off valve, two amber caution lights that relate to low quantity in the wing tanks and a single red light that means you’re down to the fuel in your sump tank. Effectively, if you make sure that there’s sufficient fuel in the tanks, the big red handle is ‘ON’ and no fuel warning lights are illuminated, your fuel management is complete. The airtest aircraft today is the turbocharged variant of the GA8 Airvan. Beneath the cowling is housed a Lycoming TIO-540 six-cylinder, fuel-injected turbo-charged engine compared with the straight IO-540 of its normally aspirated brother. Producing 320hp (240kW) and driving a Hartzell three-bladed constant-speed prop, Dave emphasises that for operations up to 10,000ft, both aircraft are very parallel but for higher operations such as parachuting, the turbocharged variant holds the edge by minimising the time to climb to the flight levels. At 55 per cent power at 8000ft, the Airvan will offer a range of around 700nm at 124kt, equating to over five hours aloft. As I continue to walk around the aircraft, it continues to impress. The windows are slightly bubbled and not only enhance the passengers’ view but reduce any tendency for the surface to vibrate in the slipstream. The main landing gear consists of two faired, tapered steel spring tubes, while the nosewheel offers shock absorption through an enclosed arrangement consisting of an internal piston acting on an oil-damped heavy-duty coil spring. No need to pressurise it, so importantly it can’t go flat. Tyres and brakes are all made from the most commonly supplied parts over the Aviall catalogue for ease of purchase and a minimum of downtime. Beneath the belly, a large cargo pod can carry 200kg through two side doors and one aft door for long items. And how did GippsAero’s designers come to a size for the doors? They went and purchased the largest Samsonite bags and made them fit. Yet the pod is interesting on two more counts. Firstly, unlike the Cessna 206’s, the capacity is not eroded by the underside of a curved fuselage. And secondly, testing proved there is no drag penalty and trade-off in speed for having the pod fitted as it assists in streamlining airflow along the aft fuselage. As I board the Airvan, the vast expanse of its interior becomes evident. The cabin gives a big aeroplane feel with its large entry door, higher ceiling and a generous aisle not found on its contemporaries. This aeroplane may be a workhorse but the interior has a finish that will impress any passenger. To the rear there is a cargo shelf and an aft locker, while the high-backed seats and overhead switches up front give the passengers a totally different ‘feel’ to clambering through a small side door and over folding seats. The cockpit has the sense of a flightdeck. 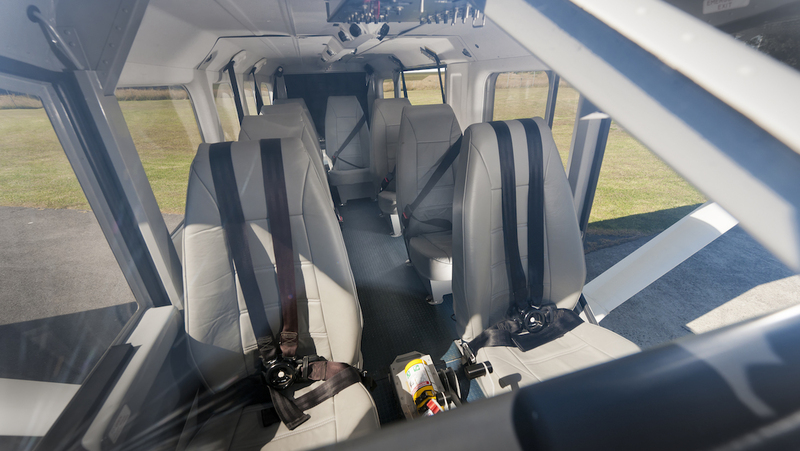 Aside from the overhead panel and ‘bus bars’, the yoke extends from the floor like a baby Boeing and the centre pedestal has an impressive array of levers, switches, cowl flaps and a sizeable trim wheel. Between my seat and the pedestal is a floor-mounted manual flap lever that actuates generous wing flaps down to 38 degrees. There is no electric actuation, just a large lever like you used to find on the Piper Cherokees. It has three settings – ‘up’, ‘takeoff’ and ‘landing’ – a great idea for a working aeroplane as it is reliable and low on maintenance. The aircraft to be flown had an analogue instrument panel with an impressive digital avionics stack of Garmin equipment and moving maps. 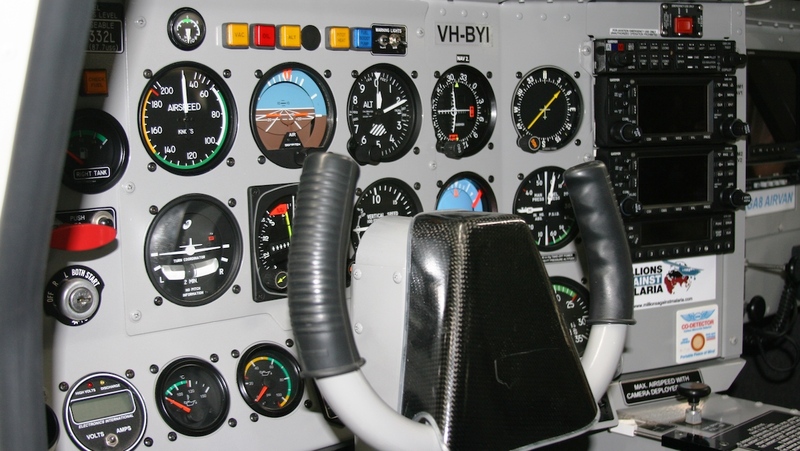 There is a wide range of instrument and avionics packages available, so it’s really up to the buyer. For today’s flight, the Airvan will uplift Dave and I and about 120 litres of fuel. We are at a light weight but at the forward centre of gravity for the aeroplane, meaning the control forces will feel at their heaviest and most stable. Consequently, when the aircraft is loaded up in the commercial world it will become progressively lighter on the controls. Starting the aircraft is as simple as a short priming of fuel, followed by a lean mixture start and a turn of the key. The large Lycoming bursts into life and we’re ready to get underway. Outside, the wind is blowing at about 20kt and gusting a little more, although we are lucky that the cloud base is sitting high enough for our airwork. I depress the parking brake lever atop the centre pedestal and we’re heading to the gravel runway 27. Taxiing is very straightforward with the direct linkage steering from the rudder pedals, while the visibility ahead is excellent. The top of the instrument panel sits relatively low in relation to the seat position, so you are looking down on the top of the cowling. After completing our pre-takeoff sequences and checks, Dave and I discuss the emergency actions before I quote some book speeds that I studied earlier. Just as the aeroplane is practical, so is Dave as he explains that taking off is as simple as “6-7-8”. Rotate at 60kt, initial climb at 70kt and retract flap to climb away at 80kt. I like it. As the throttle is advanced with the pitch full fine, a conservative setting of 38” boost is set and the aircraft accelerates briskly from the sealed ends and along the runway’s gravel. After only about 200m we “6-7-8” and take to the skies with an impressive rate of climb about 1000ft/min with the nose still on the horizon and 80kt indicated. Levelling off at 4500ft and closing the cowl flap, the nose is pitched down and the aircraft allowed to accelerate before the power is reduced to a typical setting of 23”/2400rpm. As the aircraft accelerates, patience is called for to continually wind the trim wheel forward until the aircraft is established in the cruise attitude. Failure to do so will call for a little bit of muscle at this forward CofG, so it’s a good idea to stay in trim. We fly a series of limit turns and the roll rate is good for an aeroplane that doesn’t profess to be a sports machine. However, it’s exploring the slow end of the envelope where this aeroplane becomes fun. Firstly, we look at the after-takeoff stall configuration because of its very high nose attitude. With full power and one stage of the flap the nose is sitting up seemingly close to the vertical and the airspeed is lower than the last marking at 40kt, so you’d be grossly negligent to be here in the first place. However, at the point of stall the lift breaks away and the nose drops straight down textbook style. By comparison, the landing configuration and clean stalls were absolutely benign – the book quotes that they occur at 62 and 56kt respectively at maximum weight. Next I fly the aircraft in the cruise at 80kt and extend and retract the flaps through the range and am immediately surprised by how little re-trimming is required. I then set the aircraft up with a low power setting of 20”/2000rpm and select full flap to indicate around 60kt. Unbelievably with flap hanging out and low power, I can still climb away at around 400ft/min. In a more conventional low-speed configuration with one stage of flap, the aircraft can be flown comfortably at 60kt with a very small turning radius. The view down beside me through the bubbled window is splendid and the world is sliding by very slowly – in fact, any slower and you’d need to be equipped with a tail rotor I suspect. Cruising around the Gippsland region, the Airvan offers a very smooth ride in rather blustery conditions, so I suspect this would be another endearing quality to the operators of scenic flights. After flying some more sweeping turns just for fun, it’s time to head for the circuit and we simulate an engine failure and trim the aircraft for descent. At 76kt we drift down at around 750ft/min and I suspect the rate would be about 600ft/min if we weren’t at the forward CofG. Ultimately, a gliding range of around 10nm from 10,000ft is a very respectable range. A view of the GA8 in flight from the cabin. Back in the circuit, I slow the aircraft on late downwind and in the white arc at less than 97kt I extend the first stage of flap before turning onto base and lifting the lever for the final stage. Once again, the trimming needs to be timely but not exorbitant. Set up on base with about 15” of power, the aircraft sits nicely in the slot and the aeroplane’s visibility is appreciated once again. Turning onto final at 75kt, the aim point just sits in the windscreen of this stable platform, even though the wind outside continues to blow. Through the final 100ft the attitude is held steady and the power is smoothly bled off to idle and the speed back to 70kt as the runway approaches the wheels. With the throttle definitely closed the nose is smoothly raised towards the horizon and the aircraft is held off until the wheels touch. It’s a very straightforward aeroplane. We fly a series of touch-and-goes and a stop-and-go and throughout the aeroplane is very simple to fly. In a maximum performance takeoff the aircraft is airborne in seemingly about 150m and stops in about the same distance. I let Dave know that I’d like to see the pitch change and performance in a low level go-around and he advises me to take it right down to the ground, touch down and takeoff again with full flap. I comply with his instructions and the whole sequence is a non-event. The aeroplane climbs away effortlessly with its barn door flaps extended, while when I retract the flaps at a safe height the pitch changes seem minimal and are easily matched through manual force and then through the large trim wheel beside my right knee. It’s time to return to the hangar and we perform one last short field landing before taxiing back. On the ground, the Airvan appears to be a straightforward aeroplane, not professing to boast any particular grace or gimmicks. In the air, it follows through on this promise. It’s a no-nonsense aircraft designed to get the job done. 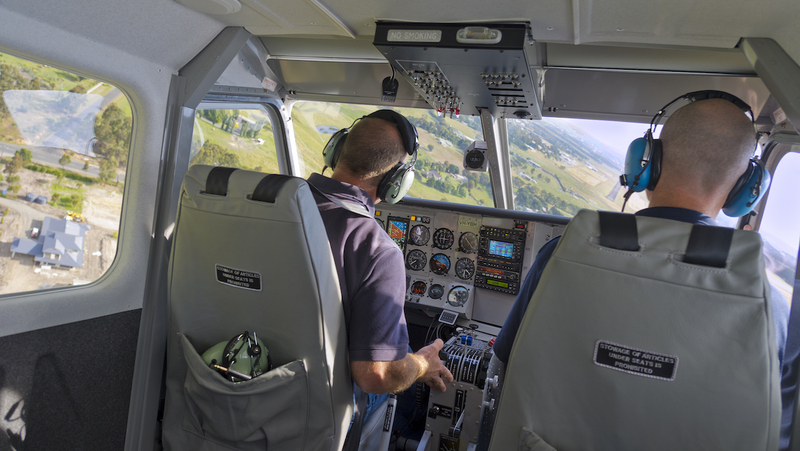 Operators often entrust their brand new Airvan to their most junior pilots and it is easy to see why. Between its simple fuel system, rugged undercarriage and forgiving handling it should keep even the lowest-time pilot out of trouble. In fact, in many ways its simplicity is more akin to a Cessna 152 than a 206. GippsAero saw a niche in the market and built an aeroplane to fill that space. In the process it has not only filled a void for operators – but also given pilots an ideal tool to get the job done. And that job may be one of many roles across an even broader range of operating environments. The GA8 Airvan is a genuine Aussie workhorse that would be at home in any paddock you could find. VIDEO: A 2015 promotional video of the Airvan 8 from the Mahindra Aerospace YouTube channel. Postscript: Indian firm Mahindra Aerospace became the majority owner of Gipps Aero in 2009. The G8 Airvan was officially renamed the Mahindra Airvan 8 in 2014. This story first appeared in the March 2012 edition of Australian Aviation. To read more stories like this, become a member here.